*Editor’s Note: I’m sad to report that this restaurant is not longer open. Recently, I wrote about a particularly crazy meal I ate at Los Perros Locos. They delivered a kind of craziness through the sheer brashness of piling as many wacky pedestrian ingredients on top of one another as humanly possible. But, like I’ve said before, there are many kinds of crazy when it comes to food. To celebrate my 26th birthday, my girlfriend took me to a restaurant that’s been high up on my worldwide to-do list for a long time, WD~50. 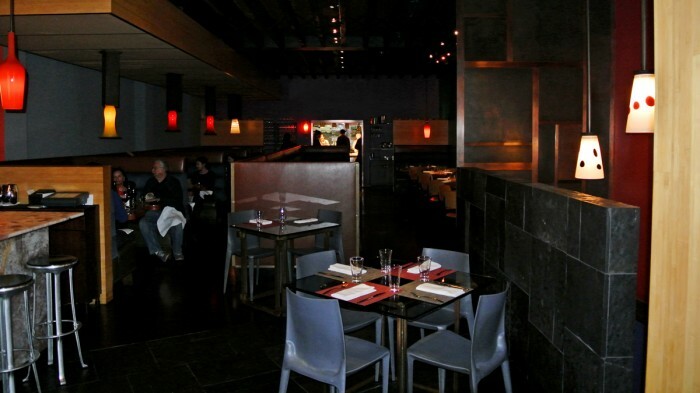 The restaurant is the brain-child of Wylie Dufresne who established the molecular gastronomy dining scene in NYC. The kind of craziness that Wylie delivers is less like that of a psychopath, but more like that of a mad scientist through his use of complex, technical, processes and methodologies usually reserved for a chemistry lab. Every dish and drink at WD~50 has some sort of complicated twist whereby an ingredient is transformed or presented in a way you’ve probably never experienced before. For instance, let’s start with the table bread they presented to all guests at the start of the meal. It was a sesame flat bread, but by whatever complex processes they used it was literally the thinnest bread I’d ever seen. It was thinner than paper with a skin-like translucency and flaky texture that crumbled if I didn’t handle it carefully enough. There was a nice level of salt and enough texture from the seeds to make it a very nice dish to munch on while we waited for the rest of our meal to arrive. Anyway, the restaurant previously served dishes a la carte, but at the time of this meal had two different tasting menu options. Their primary menu was twelve dishes long and included all of Wylie’s latest experiments. We instead opted for the “From The Vault” menu which was a five dish tasting menu of his greatest hits from the restaurant’s past resurrected as an ultimate tribute to their history along with a wine pairing. We also decided to start the meal with a cocktail. As you’d probably expect, their cocktail menu was very unique. After consulting with the waitress, she reassured me in my instinctive decision to select the Matte Black, a rendition of a martini with a Wylie twist. 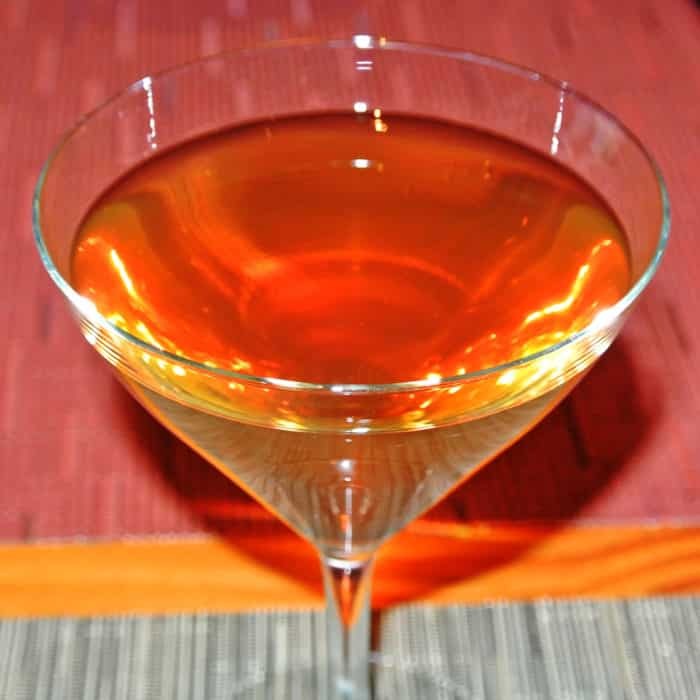 The drink started simply with gin, but instead of using any old vermouth, they infused theirs with black garlic. The drink was very refined and though the black garlic was quite subtle it most definitely made its presence known as a twinge of something unusual, making this drink really something special. It was one of the more extraordinary cocktails I had come across in NYC. At this point, our first course, an amuse bouche, and our first glasses of wine arrived. 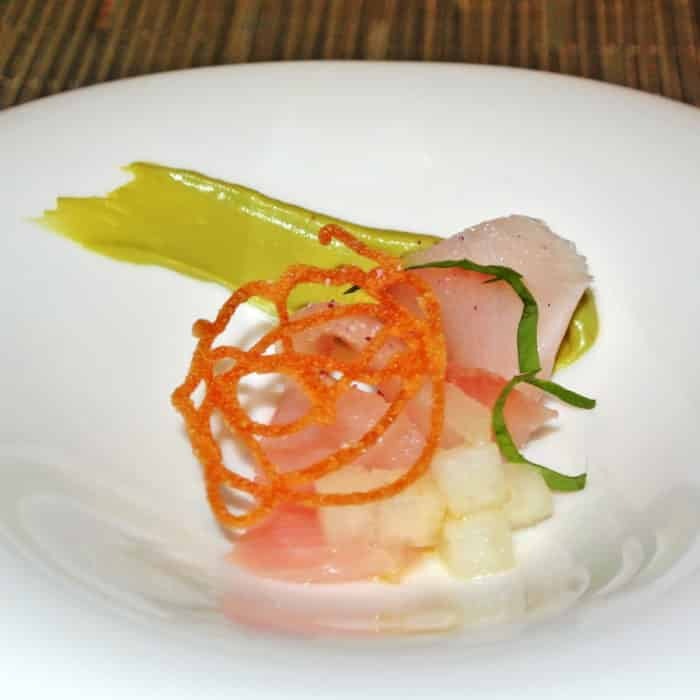 As I recall, it was a hamachi crudo served with pear cubes and a variety of other rare and unusual ingredients. It was paired with a bubbly Pinot Noir Brut Rosé that had been further fermented in its bottle in the style of champagne. The two were very tasty together and readied me for the rest of the meal ahead. Next dish involved foie gras, anchovy, tarragon, and cocoa nibs. 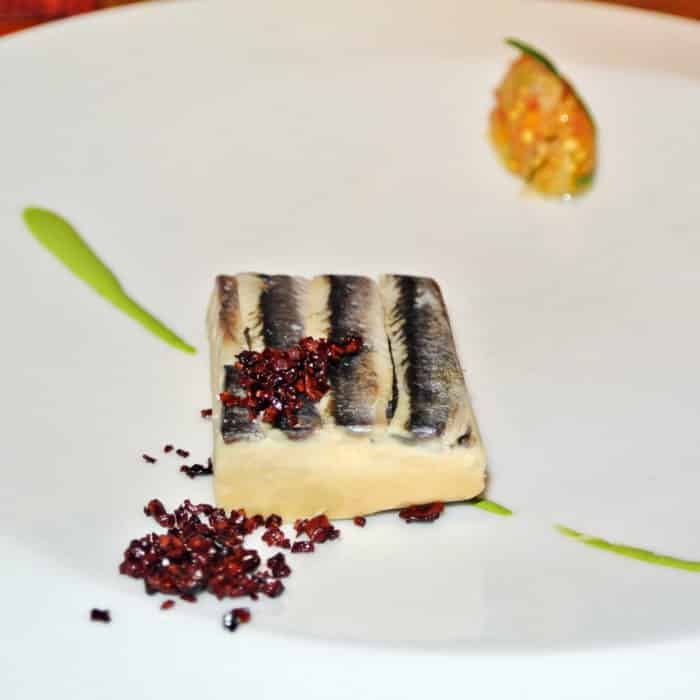 The foie gras was formed into a particularly firm rectangular brick topped with thin-sliced, layered Spanish boquerones which were quite similar to anchovies. This block was sprinkled with grated cocoa nibs, which seemed like the odd man out, but somehow were the element that really tied it all together, mostly due to their texture. On the back of the plate, there was also a mound of what I believed was mustard seeds along with raw fish in a sort of whipped mousse form. 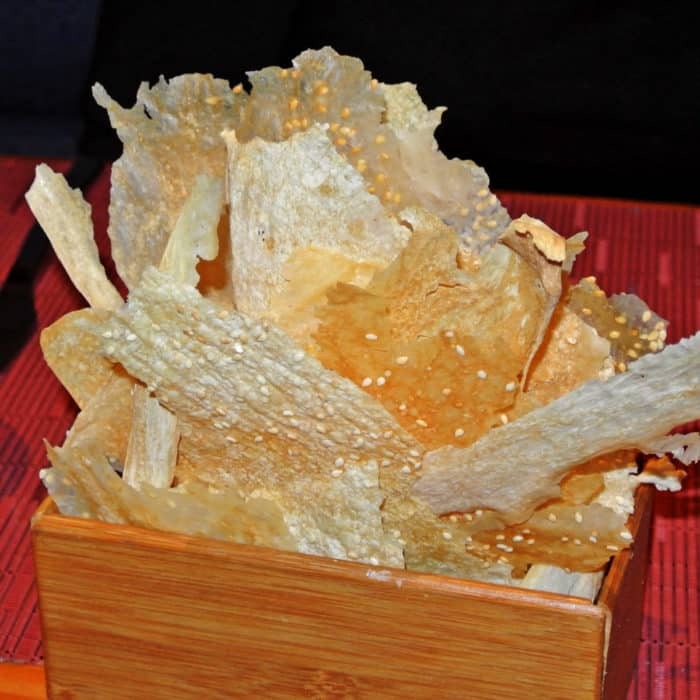 This salty, vinegary, seafoody punch served as a nice foil to the deeply rich and fatty foie gras bites. This dish was paired with another glass of the same Pinot Noir Brut Rosé from the previous course. 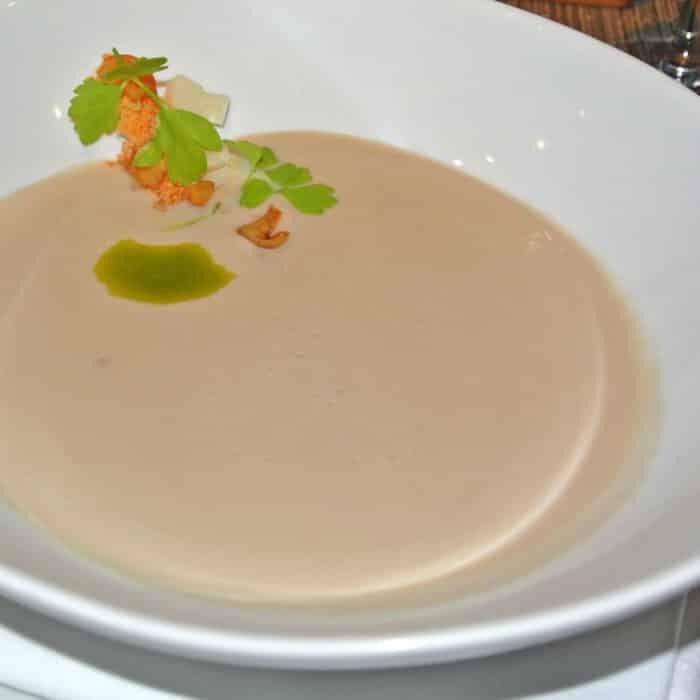 Next up was a soup course which was made with a malted chestnut broth, salmon threads, celery root, and chestnut oil. There was a serious level of restraint shown in this course. The flavor profile was quite mild, but also very soothing. The chestnut broth had a creamy thickness that had a wintery comfort to it, but it was the salmon threads that really brought the biggest twist. Salmon threads were essentially dried, dehydrated salmon that had been shredded into stringy strands. When stirred into the soup, they added a salty, fishy funkiness that was really unexpected next to the warmth of the chestnut flavor. This course was paired with a very mellow white wine, a Pinot Grigio, that seemed to fit nicely by not overpowering the soup. The next course was a fish dish made of turbot, salsify, coffee-saffron, and smoked bulghur. The turbot was prepared in a style known as sous-vide, a technique that involves air-sealing in a plastic bag and submerging in a low-temperature water bath for very long periods of time for even and gentle cooking. 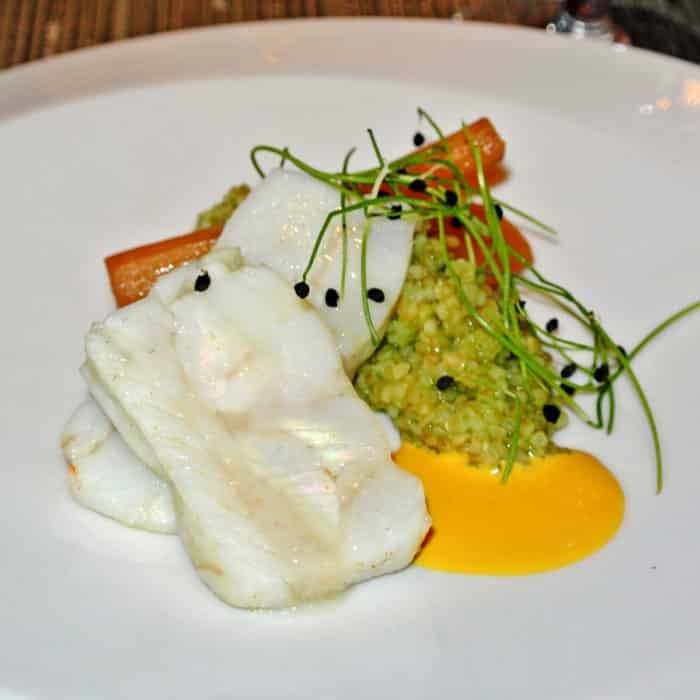 The fish had a beautiful texture from the process and derived most of its flavor from the accompanying coffee-saffron sauce and the seriously smokey and herbal bulghur wheat grains. I was previous unfamiliar with salsify, which I have now learned is related to the sunflower but has a bit of a carrot-like texture and a subtle oyster-like flavor. This course was served with a bubbly Rosé from Corsica, another nice pairing. Up to this point, Amy and I both found all of the courses to be expertly prepared and definitely interesting. 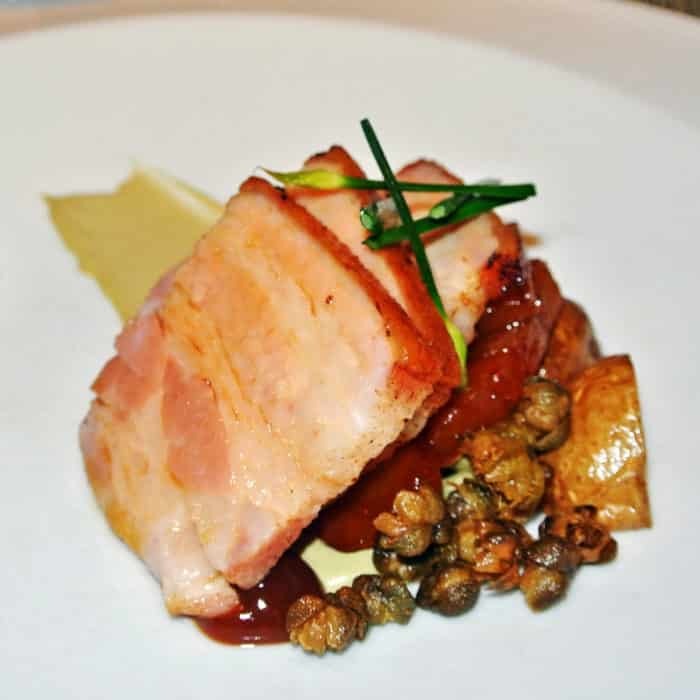 But, nothing had really wowed us flavorwise until we tried this next dish featuring pork belly, ancho, pineapple, and capers. These slices of pork belly had an incredible silky texture that sat somewhere between luscious pork belly and a honey glazed ham. There were two sauces on the plate, a light green one that had most of the bold, ancho spice in it and a dark brown sauce that was boldly pineapple-y. The capers were deep-fried and blossomed, which gave them a wonderful texture and mild brininess. Honestly, this dish was even more incredible when I got a little bit of everything in a single bite. There was just so much going on with the interplay of flavors and textures, allowing each element to build upon and improve the next to make something so much more than the sum of its parts. This dish was extraordinary and in my opinion the crowning achievement at WD~50. This bold, meaty course came served with an excellent fruit-forward Grenache red wine that unsurprisingly paired very well. It was at this point that we were transitioned over to dessert. 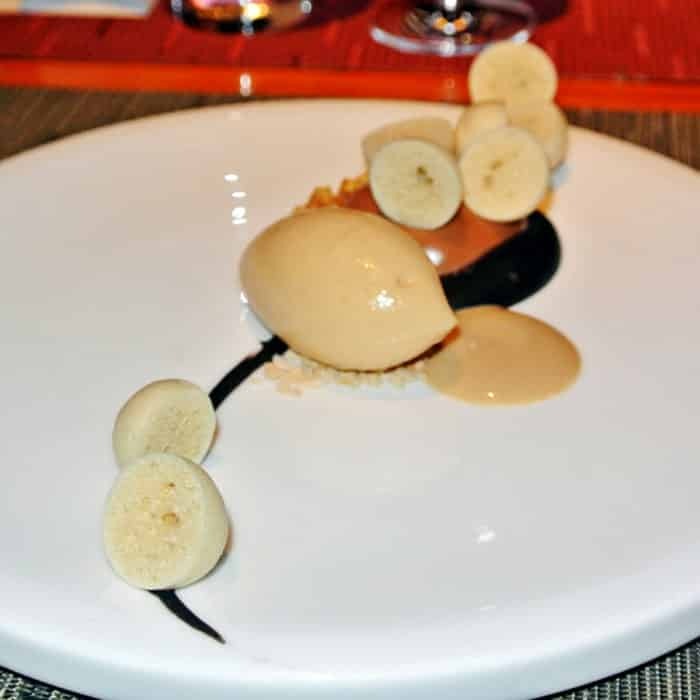 As part of the tasting menu, we received a dessert made of milk chocolate, black bean, plantain, and peanut. There were a number of components to this dish including ice cream, malted milk balls, ground peanuts, a pudding-like substance, and a swirl of liquid chocolate. The milk chocolate was, I believe, formed into those dehydrated malted milk hemispheres and well as the decorative swirls across the plate. And the plantain appeared in the ice cream. Amy and I both agreed that the ice cream, while delicious on its own, detracted from the rest of the dish as a whole. So, we ate the ice cream separately and all of the other components together. This course came served with glasses of port. I definitely would not consider myself a port expert, but I’m absolutely obsessed with this bottle called Porto “Black” Quinta de Noval. It had a very full-bodied flavor with strong fruit notes without being overly sweet. Like I said earlier, we were at WD~50 for the occasion of my birthday. 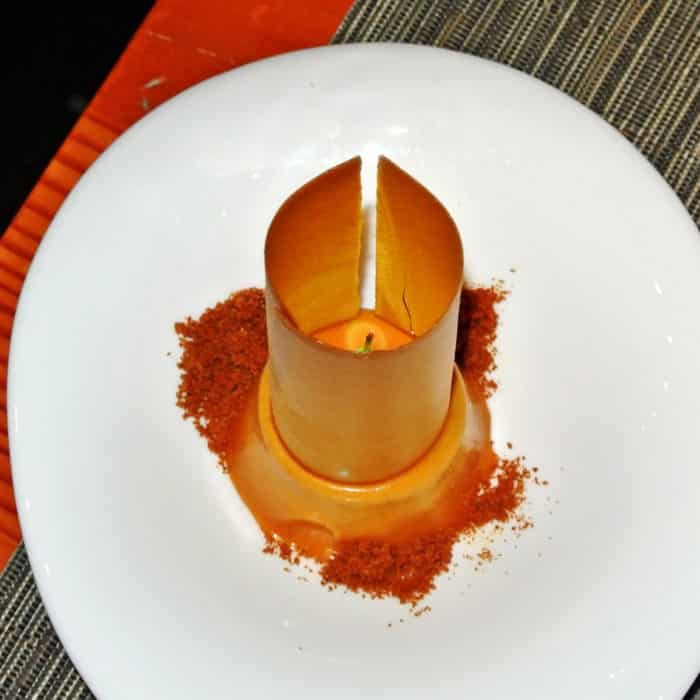 It was at this point that they brought out an additional, special dessert, this time with a lit candle inside. This dish was their rendition of flan, but obviously there was a twist. There was a powder sprinkled onto the dish that was made from dehydrated squash. The whole dish had a very full, rich, comforting, wintry almost pumpkin-y flavor profile than really hit the spot. I think this was the best dish of the meal – second only to the pork belly! What they had for us was a riff on blueberry cheesecake served in little ketchup packet shaped pillows. 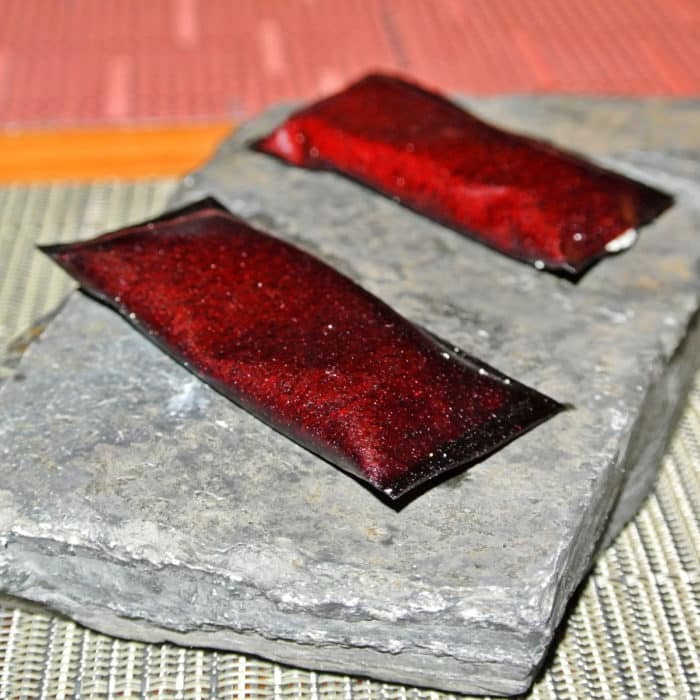 The exterior was made of blueberry fruit leather which you can think of as a fancy fruit roll-up. They used this fruit leather to encase a substance that tasted exactly like cheesecake. But, the substance inside was powdery, almost chalky, yet somehow was still rich and creamy as it combined with my saliva. It was a pretty magical creation and an awesome way to finish out this brilliant, surreal meal. So, if you’ve never had the opportunity to experience molecular gastronomy before, I’d highly recommend giving it a shot. 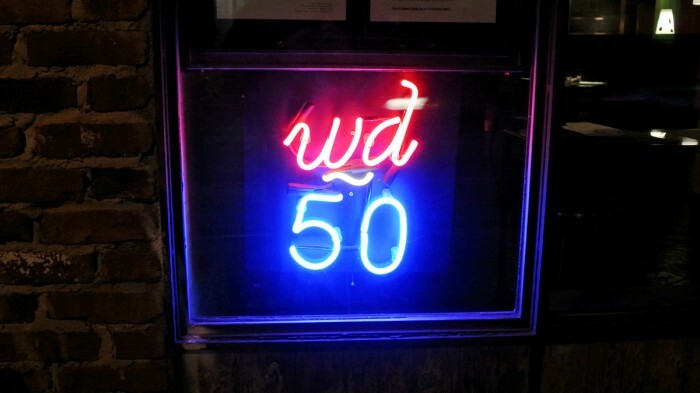 Though WD~50 is no longer open, Wylie’s effect is still readily felt across the formal dining scene. It was certainly a pricey meal and probably not something that everyone will appreciate or enjoy. But, it was such a special experience with clear moments of sheer culinary genius that often felt like pure magic. Got another truly incredible restaurant in NYC that I should check out? Let me know in the comments below.